Franklin Mills offers the largest selection of index dividers for case exhibits, motions, depositions and briefs. Our indexes provide a quick reference for legal industry professionals interested in dramatically reducing the cost of document preparation. We offer a wide range of stock individually packed titles/dividers and complete sets for almost any need. 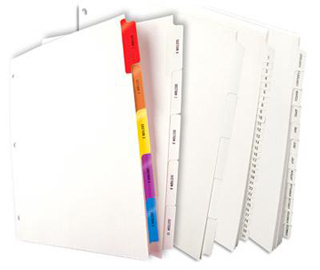 Fast, organized and inexpensive � our dividers are the perfect solution for controlling legal paperwork. Please contact us directly at 1.888.678.4585 if you need personal assistance in ordering legal dividers for your law firm.